Riverview Park is located at the end of Chesapeake Street at the eastern city limits and consists of 26.6 acres bordering the river. This land was donated by Riverview Cemetery in 1974 for use as public space and by 1989 it was renovated into a park. With a large paved parking area, kiosk, playground, grill, two benches and an open field, this park is ideal for picnickers and families. The adjacent Rivanna Greenbelt trail provides opportunities for walking, jogging, bicycling, fishing or simply observing wildlife. The park is open 6AM to 9PM. 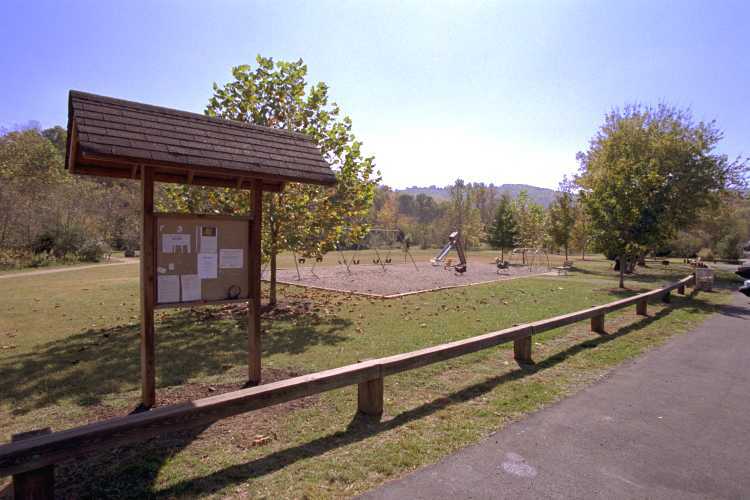 As of January, 2002, a city-wide leash law went into effect for all city parks, with the exception of inside the fenced off-leash area at Azalea Park and in designated portions here on the Rivanna Greenbelt trail ONLY on Tuesdays, Wednesdays, Thursdays. This time-sharing plan for off-leash activity is being conducted on a 6 month trial basis; successful compliance will determine if it is extended. Pay attention to the signs designating the off-leash portions of the trail! And City code requires people to clean up after pets that are in their care in the park. A dispenser/waste receptacle near the kiosk provides dog owners with plastic waste removal bags for this purpose. Failure to comply with the leash law and dog waste removal law is a Class 4 misdemeanor. The Rivanna Greenbelt is a handicapped-accessible paved trail that starts at Riverview Park and meanders north about 1.25 miles to Free Bridge / Route 250 Bypass East (at the base of Pantops) along the Rivanna river. The Greenbelt is actually a public right-of-way across private property but it is maintained by Parks and Grounds; please respect the adjacent private property by staying on the paved trail. The Greenbelt is also part of the Rivanna Trail, a pedestrian trail system that encircles the City and which is maintained by a private non-profit foundation.